Do other planets in our solar system experience weather? Not counting Earth, the inner planets—Mars, Venus, and Mercury—all have atmospheres. The atmosphere on Mars is very thin, and it has an air pressure about one percent that of Earth’s. Theories abound as to why Mars lost its atmosphere, ranging from giant asteroids smashing into the planet and ripping away its air, to the lack of plate tectonics providing sufficient heat, to the idea that the planet somehow lost its magnetosphere. Without much atmosphere, Mars does not have much weather. Mercury, similarly, has virtually no atmosphere and is essentially a big rock in space. Venus is far more interesting than either Mars or Mercury, in terms of atmosphere. It is a planet with an atmosphere too rich in carbon dioxide, and consequently it experiences a “runaway greenhouse effect” that heats the surface to 900°F (500°C), which is hot enough to melt metals like lead, tin, and zinc. Poor Pluto, which has been downgraded in status from planet to planetoid, has a thin atmosphere containing nitrogen, methane, and carbon monoxide. Several moons in our solar system also have atmospheres. 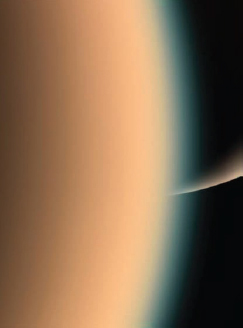 Of these, Saturn’s Titan is perhaps the most interesting. Its dense atmosphere (50 percent denser than Earth’s) contains 98.4 percent nitrogen and 1.6 percent methane. Astronomers believe that Titan has lakes and seas composed of liquid methane and nitrogen, and that it experiences rain showers made of methane. A smoggy, orange haze made of hydrocarbons envelopes the atmosphere. Some other moons have thin atmospheres, such as Neptune’s Triton, and Ganymede, which is another moon circling Jupiter, is believed to have a water ocean beneath a layer of ice.